I am now on Facebook so be sure to like the page here. I have a few new posts in the works that I will be sharing soon on recipes, garden updates and ring sling reviews you wont want to miss. We are continuing to work on the website so I look forward to sharing that with you soon!!! A few months ago I bought a Basil at my Trader Joe’s and set it outside. Two days later I go to retrieve some leaves for dinner and all that’s left of it is sticks. I couldn’t believe that in 2 days I lost a large basil plant to the local brown snails. I really wish I had before and after pictures. I was shocked. 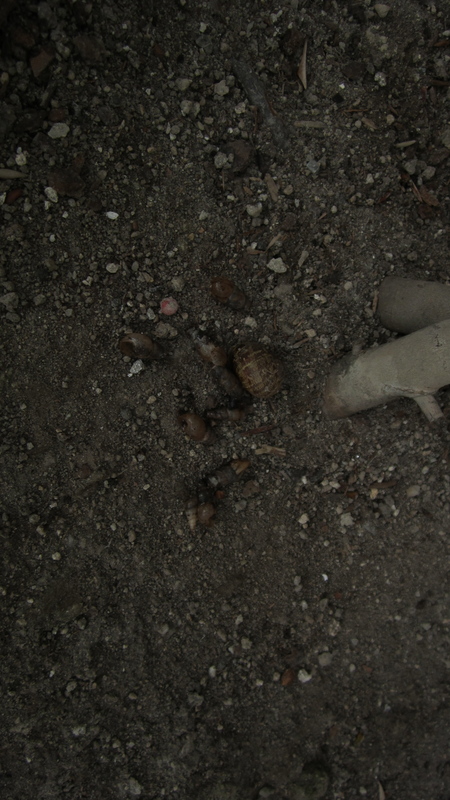 Later that week I went to the Green Thumb to get worms for the Worm Factory and saw a package for carnivorous snails. Sounded kind of gruesome but once I thought about it I decided that one animal eating another is better than poisoning an animal to death. 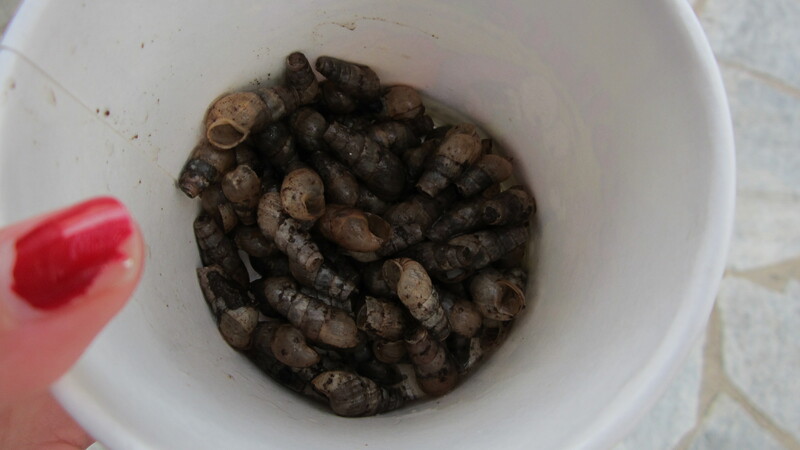 I decided that when I started working on the garden I would come back to pick up these snails in hopes that it will keep the brown snails from eating all my plants. Following the release instructions on the package I released them under the rose bush, under the tree and blackberry bush as well as below the Camilla. I realize I may have to buy more later to restock my garden as there isn’t much organic matter to feed on right now and they may leave the area in search of food. But now that the blackberry bush, mints and basil are outside I am hoping they survive the next few days. 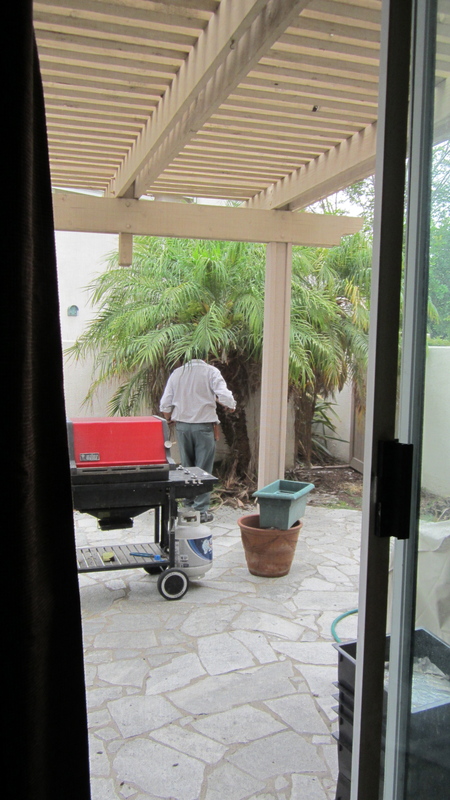 Garden Makeover – Goodbye Palm!! As the make over continues we are having the palm removed. It is dropping tons of seed and we don’t want to spray it with chemicals to stop that process as it will get into the rest of the soil as well. Also its grown so big that it is blocking the gate. This isn’t directly from Pinterest more Pinterest inspired. I have so many projects I want to make from Ana White that it find it inspiring me in other ways. 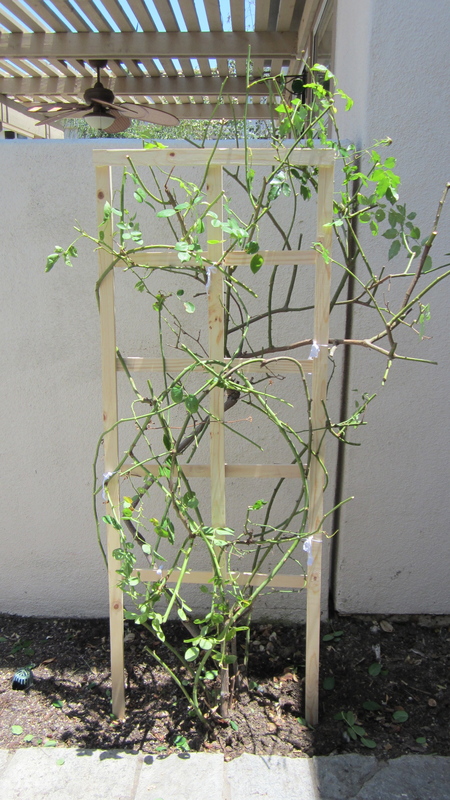 I wanted a new trellis for my climbing rose and when I went to buy one I was shocked by the $50 price tag. Here is one I made for A little less than $15. 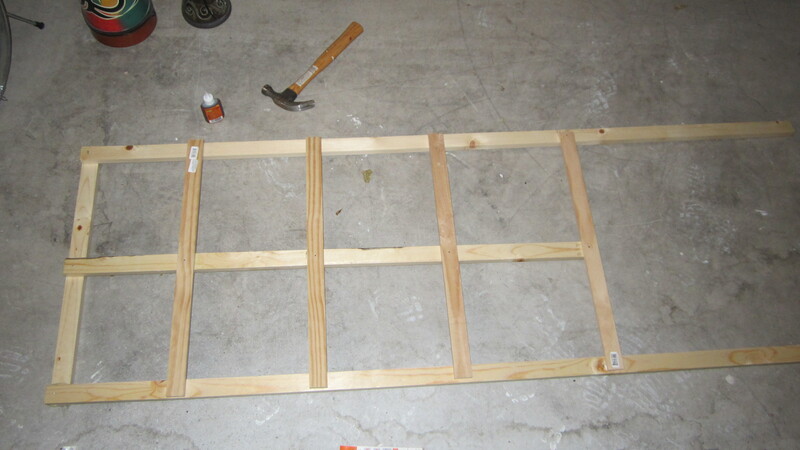 At Lowes I purchased 3 1″x2″x6′ white wood boards and 4 poplar craft boards that are 3/8 x 2 x 24″. I had the guy at Lowes make a cut on one of the 6′ board so that it was 4′ and 2′. 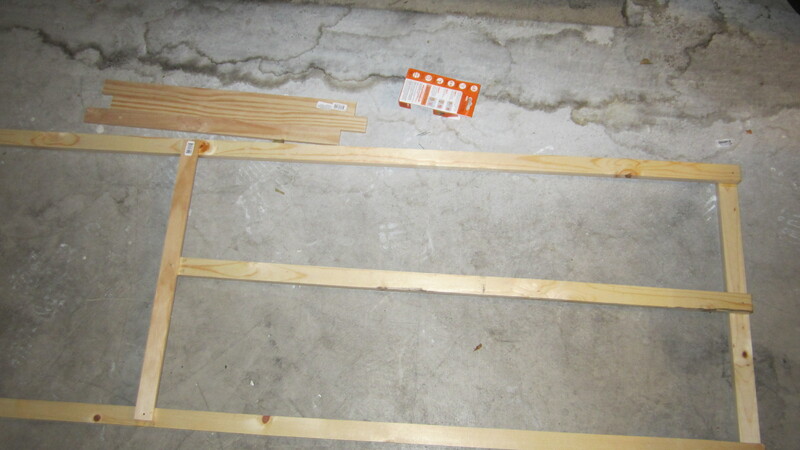 I laid out the 3 boards used Gorilla Glue and nails to secure the top board. Then flipped it and placed the remaining poplar boards lower down. I did all this in about 10 minutes and only used a level when first securing the top board. Mainly because I was lazy and just wanted this done quick. The hours reviewing project plans on Ana White have given me the imagination and courage to attack something simple to save myself lots of money. December 2nd of last year my husband and I received the keys to our first home. It was a short sale that took us from July to December to close on and that was considered fast for this type of purchase. Since this house was a smelly mess and left vacant for 6-12 months we had soooo much to do before we could move in. I was 7 months pregnant when we got the keys to our new dump home. It would take every weekend (including the previous weekend where we broke into the house to rip out the carpet before we got the keys) and a handyman working 6 days a week to get us moved in for Christmas weekend. Now our son is 5 months old and life has settled a bit we are starting to focus on our projects list. 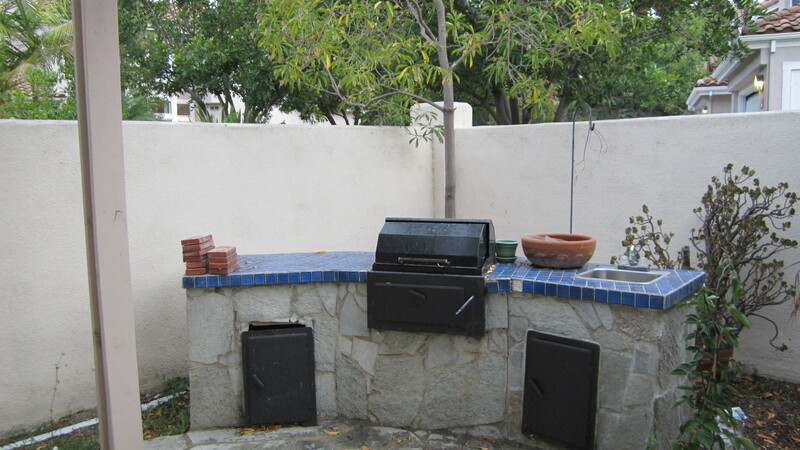 Our back patio is nicely paved and has a built-in barbecue that unfortunately was not taken care of and will need to be revamped as a later project. The patio cover needs to also have some of the boards replaced and be repainted. But I really wanted to start working on the garden. 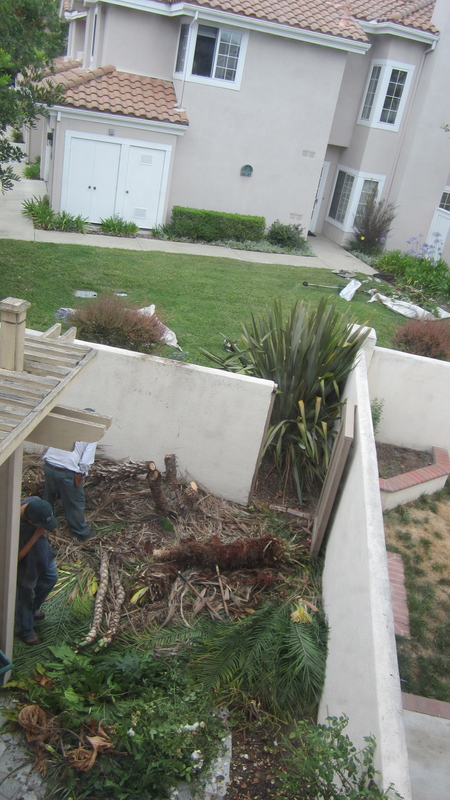 I want some of the existing plants and palm tree removed which is being done this weekend so I could visualize what to put where. I picture the garden to mainly be an edible garden and our front walk up a cutting garden. 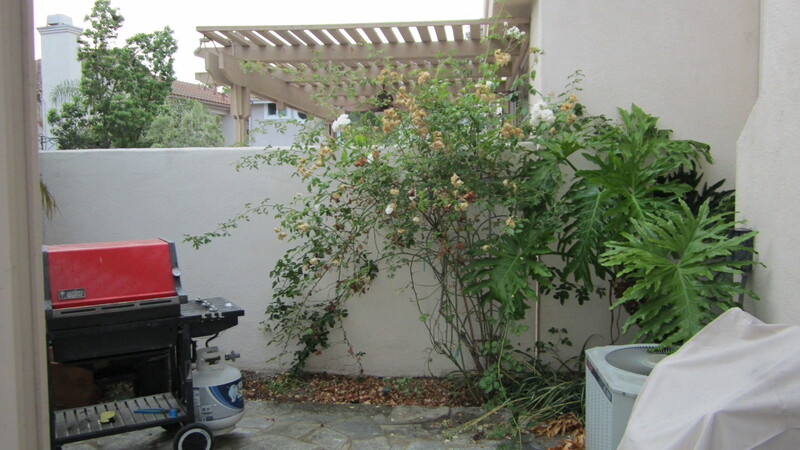 Here is what the back patio looks like right now: Climbing rose to go on new lattice and the plant to the right is being removed. Pretty messy right now. There is a lot of dirt loss to make up for and nutrients need to be added to the new soil. After this weekend it will be interesting to see how it all starts to come together! Sunday I will post pics of the progress made this weekend. I have always dreamed of having my own peaceful garden and I would love to work on my new patio but my black thumb scares me. I am determined to conquer this problem and think positive learning from my mistakes. I can’t even count the number of plants that have died in my care over the last 12 years but its enough to where my husband is dreading the amount of money I plan to put into a garden he isn’t sure will survive. Here is where I am at so far. I decided to add nutrients to my garden by getting a worm composter. I started composting using the Worm Factory on April 8, 2012. Tray one is almost ready for the garden. Tray 2 it being worked through pretty good. And I just added tray three. I have started a journal for the garden where I mapped out what is planted there now, what’s to stay, what’s to go and what I want to plant. 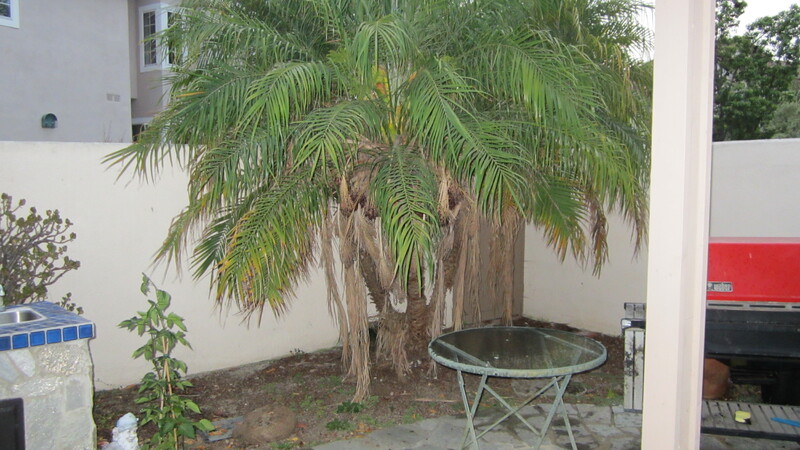 The palm and the corner plant I call an elephant ear, even though I KNOW it isn’t an elephant ear plant, are being taken out this weekend. 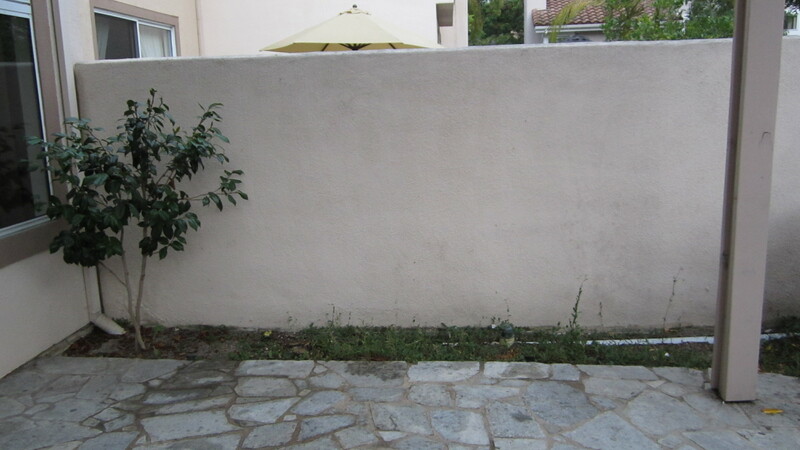 I will also have the rose bush trimmed and reworked onto a new lattice. I have a blackberry vine ready to go into the ground. A basil plant to replace the one the local snails ate in 2 days. A spearmint, and a chocolate mint. 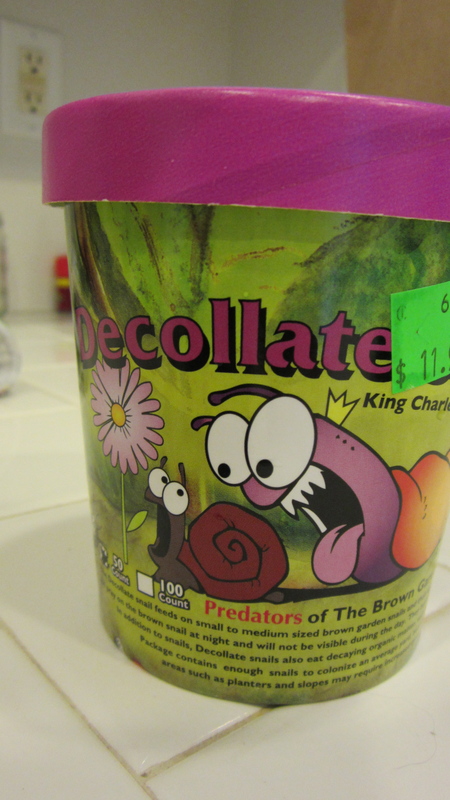 Due to the snail problem I will be releasing Decollate Snails purchased at my local Green Thumb. Then I will later work on edibles in containers and raised beds. My front entryway will be worked later so that roses, bulbs and a hydrangea will provide cut flowers for the house. This is a long term project and I have already investigated many items from Pinterest to try and use. It will be exciting to share this with you and have something to look back on that will either prove if a black thumb is curable or a disorder for life.